The technology of Virtualisation is becoming increasingly popular due to the many positives. That is why Ozeki Phone System XE can make a use of it, and can be run on a virtualised environment. The following guide will give you a better understanding about Virtualisation in general, will give you an insight of Virtual Machines, and will show you how Ozeki Phone System XE supports Virtualisation in multiple ways. Virtualisation means the simulation of something. In computing, there is a special type of virtualisation called hardware virtualisation. It makes it possible to simulate hardware for applications, making it possible for them to run, regardless of the physical hardware. The full virtualisation simulates enough hardware to run not just an application, but a whole operating system isolated from the physical hardware. This is where Ozeki Phone System XE comes to the picture. 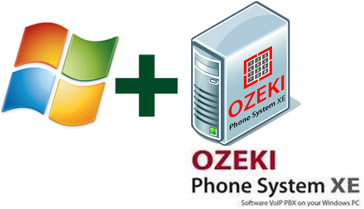 Ozeki Phone System XE is basically a Windows based PBX. The question is, can it be run on a different environment? The answer is yes, thanks to hardware virtualisation. There is a special kind of software called Virtualisation software, which can implement full virtualisation, by simulating every part of hardware, an operating system needs. These simulated hardware are called Virtual Machines or VMs. You can setup nearly every operating system on VMs, including all versions of Windows. The most important thing is that Ozeki Phone System XE can be run on a Windows system, which is operating on a virtual machine. So, if there is a virtualisation software for the environment/operating system you use, you can create a VM, install a Windows system, and run Ozeki Phone System XE on it. Oracle VM Virtualbox: The Oracle VM Virtualbox runs on all the operating systems showed on Figure 3 with high performance, while supporting many guest operating systems. That is why it is one of the most popular virtualisation softwares. VMWare ESXi:VMWare ESXI is made by the company VMWare, and is part of the so called VMWare Infrastructure. The WMWare ESXI differs from other virtualisation software, because it doesn not run over a third-party operating system and it has its own kernel, so basically it is an operating system, which can create virtual machines. QEMU:QEMU means Quick Emulator, and it is a free virtualisation software for Linux, Windows and Mac OS X.
MS Virtual PC: Microsoft Windows Virtual PC is a virtualisation program for the Windows 7 operating system. It does not run on other environments or older versions of Windows, and only supports Windows XP SP3, or newer versions for guest operating systems. Hyper-V:Hyper-V is codenamed as Viridian. It is a virtualisation program that has two versions: One version is a stand-alone product, which does not use any third-party operating systems to run on, and the other version is an installable software for the Microsoft Windows Server operating systems. Parallels:Parallels Inc. is a company which made the Parallels Desktop for Mac and Parallels Server for Mac hardware virtualisation products for Machintosh computer with Mac OS, and Mac OS X Server. The guide above gave you information about hardware virtualisation and how it is implemented, you have learned about virtualisation software and virtual machines, and got an inner sight about how Ozeki Phone System XE supports virtualisation.